(by Darya Safai, The Wall Street Journal) – Dorsa Derakhshani may be today’s bravest feminist. 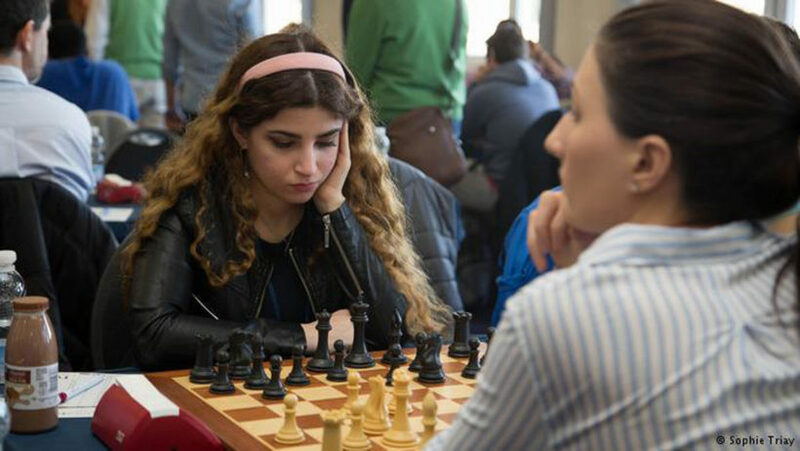 As the 18-year-old Iranian chess grandmaster competed at a January tournament in Gibraltar, she refused to don a hijab, in defiance of her country’s Islamic authorities. She was later removed from the national team. Her 15-year-old brother, Borna, was also booted, for facing off against an Israeli chess player. It would be nice to report that Western feminists rallied to Ms. Derakhshani’s defense, but they didn’t. America’s liberal feminists have been busy planning a “Day Without a Woman” to protest President Trump’s alleged misogyny. Feminists and progressives have a habit of ignoring Islamism’s female victims, preferring to focus on phantom reports of Islamophobia in the West. Enormous attention has been paid to “burqa bans” in European countries. But how many readers have heard of Ms. Derakhshani? Sweden claims it has a “feminist foreign policy,” yet during an official trip to Iran last month several female cabinet members covered their heads. How will Iranian women escape Islamism’s chokehold if European feminists submissively bow to men who refuse even to shake a woman’s hand? Days before that state visit, an Islamic court in Iran’s Lorestan Province sentenced a man and woman to death by stoning for adultery. The Swedish feminists issued nary a peep in protest of this gross violation of human rights. In the guise of cultural relativism, Western feminism appears to have evolved into a new kind of racism. The Universal Declaration of Human Rights seems not to apply to women in certain Islamic countries. Yet Western moral preening never ends. Also days before the state visit, Sweden’s deputy prime minister, Isabella Lövin, publicized a picture of herself signing a decree as seven female officials stood behind her desk. It was meant as a parody of Mr. Trump’s all-male signing ceremonies. Why are Sweden’s officials so agitated by America’s mouthy president yet so taciturn about Iran’s brutal Islamists? Why should his machismo concern them more than millions of oppressed and debased women? Such women will never stand up for the basic rights of their counterparts in Muslim countries. Such women don’t deserve to call themselves feminists. That’s an honor that rightly belongs to the likes of Dorsa Derakhshani. Published March 1, 2017 at The Wall Street Journal. Reprinted here March 2, 2017 for educational purposes only. Visit the website at wsj .com. 1. What is the main idea of Darya Safai’s commentary? 2. The purpose of an editorial/commentary is to explain, persuade, warn, criticize, entertain, praise or answer. What do you think is the purpose of Ms. Safai’s editorial? Explain your answer. 3. Tone is the attitude a writer takes towards his/her subject: the tone can be serious, humorous, sarcastic, ironic, inspiring, solemn, objective, cynical, optimistic, critical, enthusiastic…etc. Which word do you think best describes the tone of Ms. Safai’s commentary? Explain your answer. Read the “Background” below. Watch the video under “Resources.” What 2-3 adjectives would you use to describe Darya? Explain your answer. Dorsa Derakhshani, an 18-year-old member of the Iranian Women’s National Chess Team and the sixth world champion in under-18 games, was expelled from the national team for not covering her hair in the Tradewise Gibraltar Chess Festival, which was held in late January and early February 2017, Iranian media quoted Mehrdad Pahlevanzadeh, head of Iran’s Chess Federation, as saying. Her 15-year-old brother, Borna Darakhshani was also expelled from the national team because of playing with an Israeli counterpart. “The first step in dealing with them would be to deprive them from playing in Iran, and they won’t have a chance to be in the national team,” Pahlevanzadeh said. Dorsa is presently studying in Spain and had participated in the Gibraltar games independently. Her brother, who had also registered in the games on his own, played with Alexander Huzman, a grandmaster from Israel.